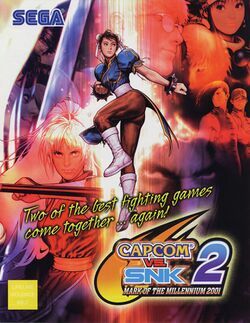 Capcom vs. SNK 2 is a fighting game that appeared in the arcades in 2001. It features characters from various Capcom and SNK franchises, most notably Street Fighter II and The King of Fighters. Though it has a 2 in the title, it is actually the third release by Capcom in the Capcom vs. SNK series. The second was an updated release of the first Capcom vs. SNK, known as Capcom vs. SNK Pro. Capcom vs. SNK 2 was released on multiple platforms such as the Sega Dreamcast, PlayStation 2, GameCube, and Xbox with slight variations to the title. The game is subtitled "Millionaire Fighting 2001" in Japan. In the United States, Capcom changed the subtitle of the PS2 version to "Mark of the Millennium 2001." However, the GameCube and Xbox versions were given a special subtitle, E.O., which stands for Extreme Offense. The GameCube version contains a divergent control system. The original 6 button version is called AC-ism, while the new version is known as GC-ism, and allows players to control the strength of punches and kicks with the analog shoulder buttons, which is something of a throw back to the original pressure sensitive punch and kick buttons used in the original Street Fighter game. Under GC-ism, special moves are executed with the yellow C analog stick. This page was last edited on 16 February 2014, at 18:38. This page has been accessed 104,971 times.